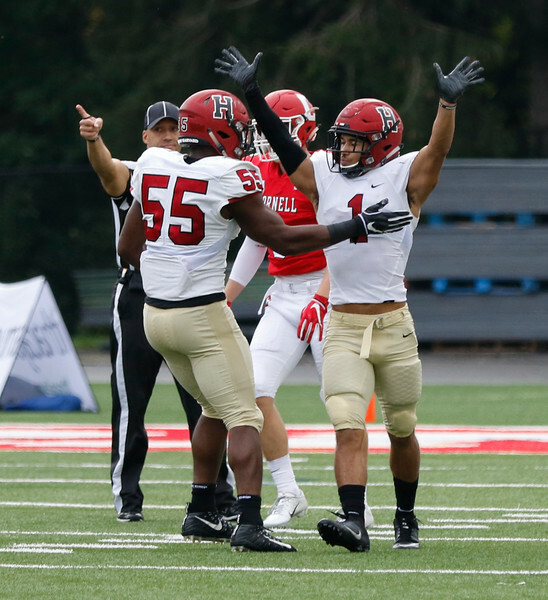 Sophomore linebacker Jordan Hill and senior defensive back Wesley Ogsbury celebrate on defense. If it surprises you that the above statement came from the mouth of Aaron Shampklin, you’re not alone. The sophomore running back exploded for 191 yards on 27 carries and a touchdown against Cornell last weekend. 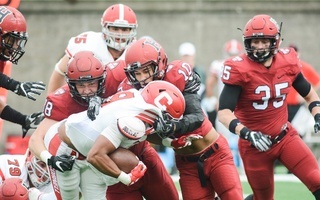 The performance marked the most rushing yards for a member of the Crimson since Paul Stanton, Jr. ’16 put up 235 against Penn during the 2014 season. However, the difference between these two striking statistical outputs is that one came in a win, and the other occurred during a loss. 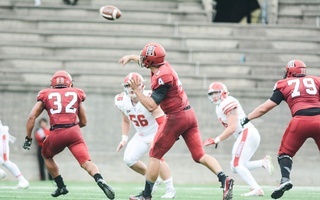 Shampklin and the entirety of the Harvard football team are searching diligently for any and every way to improve following a 28-24 loss in which Cornell erased a 24-14 fourth-quarter deficit. Less than a week after losing in Ithaca, N.Y., the Crimson (2-2, 1-1 Ivy) is back home for a Friday night matchup against Holy Cross (1-5, 0-2 Patriot). This is the final game in the team’s non-conference schedule. Harvard and Holy Cross squared off fairly recently. In 2016, the Crimson traveled to Worcester, Mass., where it lost, 27-17, and in the process snapped a 16-game road winning streak and a 16-game non-conference winning streak. This is not the same Crusaders team, however. A new coaching staff, headed by Bob Chesney, and an entirely new system has Holy Cross reeling at the moment. Its most recent game culminated in a 28-0 shutout at New Hampshire, and the team has broken the 20-point plateau just once. 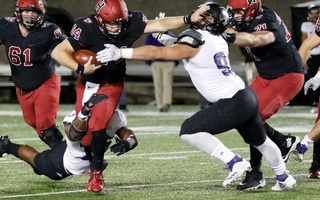 However, the lone time the Crusaders managed to score more than 20 points was a surprising 31-28 win in overtime against reigning Ivy League champion Yale. Senior defensive tackle Richie Ryan warns that Holy Cross could put it all together in a flash. Murphy categorizes this edition of Holy Cross football, a team with scholarship athletes, as similar to previous iterations: tough, physical, and defensively-focused. Based on Harvard’s recent play, this game may end up coming down to which defense comes out on top. Run defense and third-down conversion prevention have been the staples of a Crimson defensive unit that has had to do more than its fair share, in some respects. Last week, Harvard held the Big Red to just 4.4 yards per carry, and the unit is conceding just 76.3 rushing yards per game. Additionally, the defense leads the Ivy League in third and fourth-down conversion defense. Last week, Cornell converted just one of twelve conversion tries on third or fourth down. Ryan attributes this defensive success to his counterparts up front. Discipline on both sides of the ball is also playing a part in keeping the team in games. So far this season, the Crimson has limited penalties (22) and penalty yards (149). 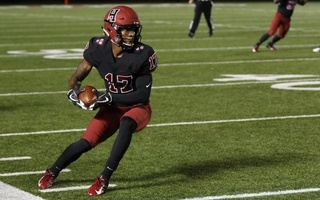 At least part of Harvard’s struggles over the past two weeks can be attributed to the failure of its quarterbacks to sync up with receivers in the passing game. For the first time since the Penn game last year, the Crimson will have a new starter at quarterback, as senior Tom Stewart gets the nod in Friday’s game. Against Cornell, Stewart and sophomore Jake Smith combined to complete 10 of 34 passes for only 137 yards, though neither tossed an interception. Though non-conference games like this one do not count toward the team’s chances of winning the Ivy League title, don’t tell that to the players. — Staff writer Jack Stockless can be reached at jack.stockless@thecrimson.com.